The fact is, we live about as far from the ocean as is possible and still be in Europe. We do have some very good fish merchants here and they do their best to provide us with what is as fresh as possible from the sea, but when it comes to shellfish and other seafood we generally have to resort to frozen products. Some of these are very good, however, and they have the advantage that we can keep them on hand in the freezer. Mix 1/2 cup plain yogurt with 2 tsp cornstarch, 1/2 tsp salt one finely chopped garlic clove. Put 8 scallops and 6 large shrimp tails in a bowl with a Tblsp curry powder and 1/2 tsp salt and mix well. Heat 2 Tblsp olive oil in a skillet, add the scallops and shrimp and cook for 4 or 5 min, turning to brown on all sides. Transfer to a plate. Add a Tblsp of oil to the pan, turn the heat down and stir in 1/2 lb halved cherry tomatoes and 6 chopped scallions. Cook until tender, about 5 minutes. 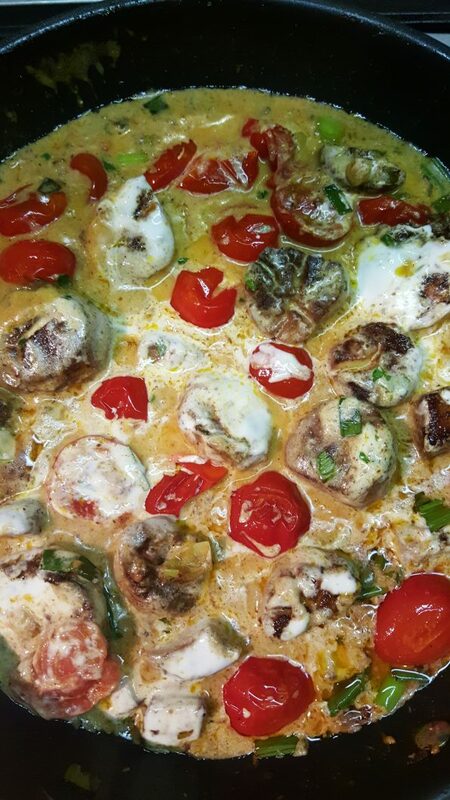 Return the scallops and shrimp to the skillet, add the yogurt mixture and heat through to cook and thicken. Serve with finely chopped green coriander (cilantro) over basmati rice. What a delicious treat. A nice, cold chardonnay goes very well with it and a light fruit sherbet would make an appropriate dessert. The autumn weather is upon us here in central Europe and with the the season for sniffles and sore throats. It has been a long time since I had a real cold, but I have one now. No fear, however, you won’t catch it by reading my words here. 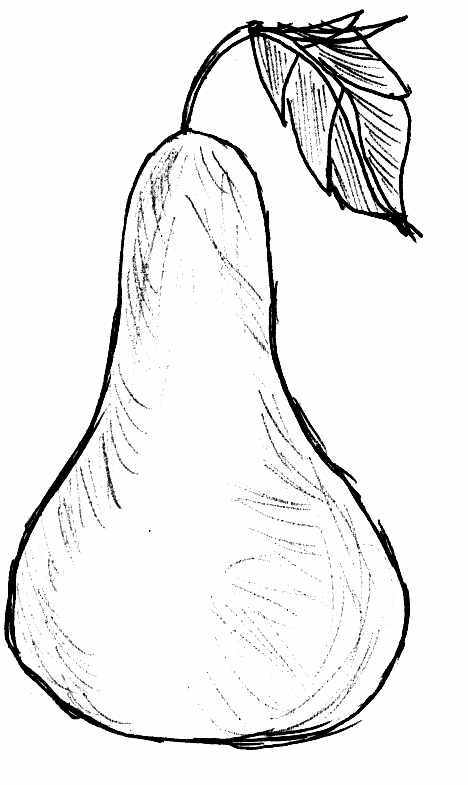 A few weeks ago we had some more beautiful pears and I remembered a recipe that was given to me some time ago. 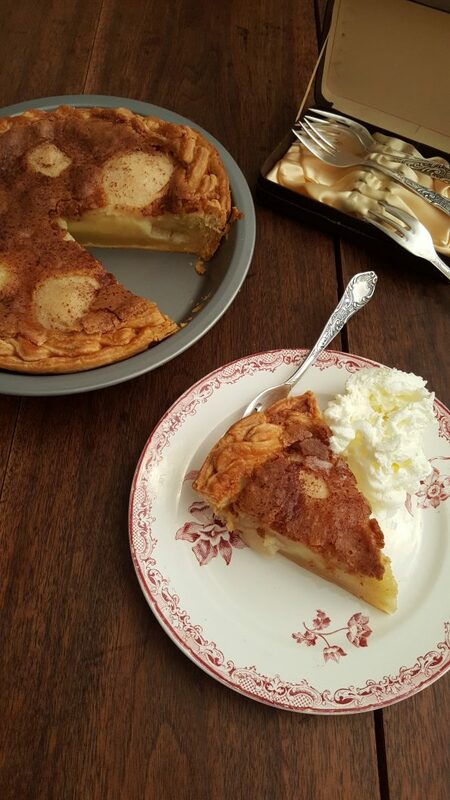 I was curious about it because it is exceptionally simple and quick, but I had been assured that the results were worth making it, so I set to peeling and cutting the pears in half, removing the core and preparing a pie plate with a crust made from pie dough I had in the refrigerator. It only takes a lower crust, the pear halves get spread on the bottom and a custard is poured over the pears before baking. Voilá! The results are wonderful. For instructions see the recipe archive. We made another big batch of pesto recently and Karin took many pictures of the process. It is not difficult, but it may be useful to show the steps. 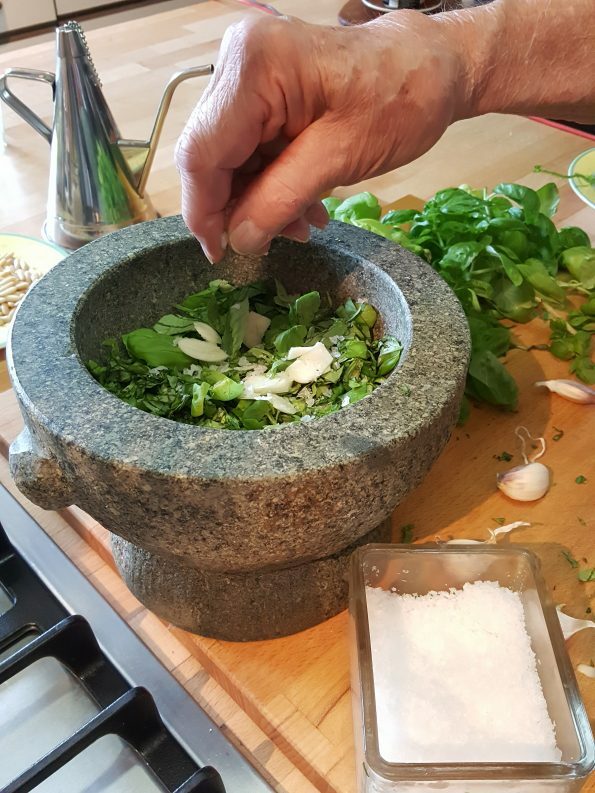 As I noted in the recipe archive we use mortar and pestle because we prefer the smoother texture than is possible with a food processor. 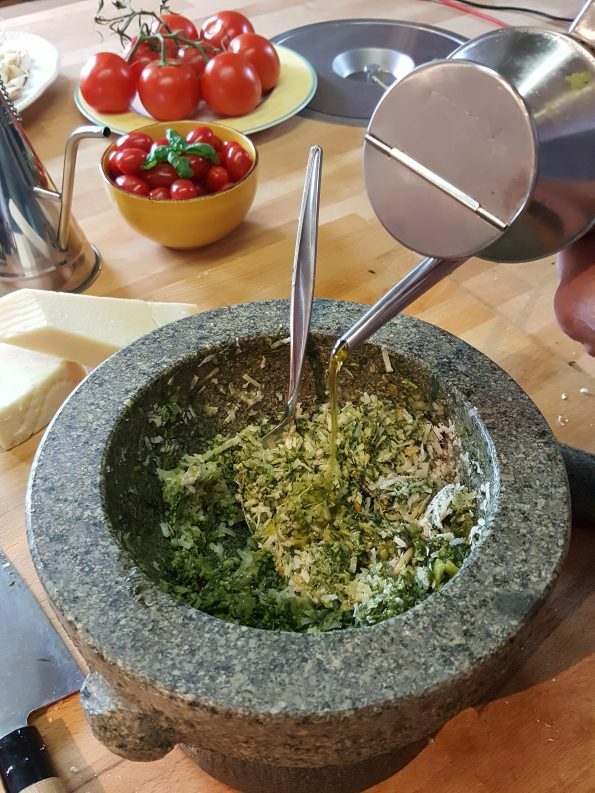 It’s also a lot of fun to beat the nonsense out of a bunch of basil leaves and pine nuts and finally, the name, pesto, derives from the pounding action of the pestle. We are going to make pesto alla Genovese here, which means using a good bunch of basil, some pine nuts and two hard Italian cheeses. There are many other varieties and you can use your imagination, for instance replacing the basil completely or in part with flat-leaf parsley, or using rocket (rucola, salad rocket, arugula, rauke) or spinach, and walnuts, almonds or pecans). You can also try other varieties of cheese, however only very firm, dry cheeses can be recommended. We have made some very nice pesto using nut oils, too. To begin with it’s always a good idea to have all the equipment and ingredients right in front of you. We need two big bunches of basil, garlic, olive oil, coarse sea salt, pine nuts, Parmesan cheese, Pecorino romano cheese. For the amounts you can look at the recipe in our archive, but the amounts do not have to be exact. 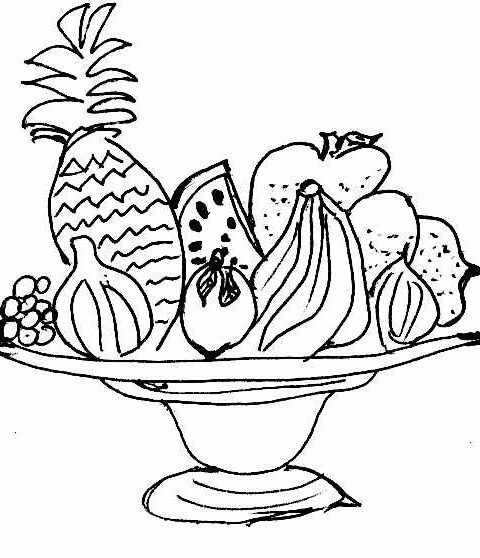 We also need a mortar and pestle, cooks knife and perhaps a spoon for tasting. If you decide to buy a mortar and pestle go for a larger diameter mortar. You will be thankful because it will be much easier to keep all of the ingredients inside and not on the counter top. We prefer stone or basalt as they are nearly indestructible, do not pick up flavours or odours and are quite inexpensive. Marble is lovely, but usually quite expensive and ceramic is easily broken. 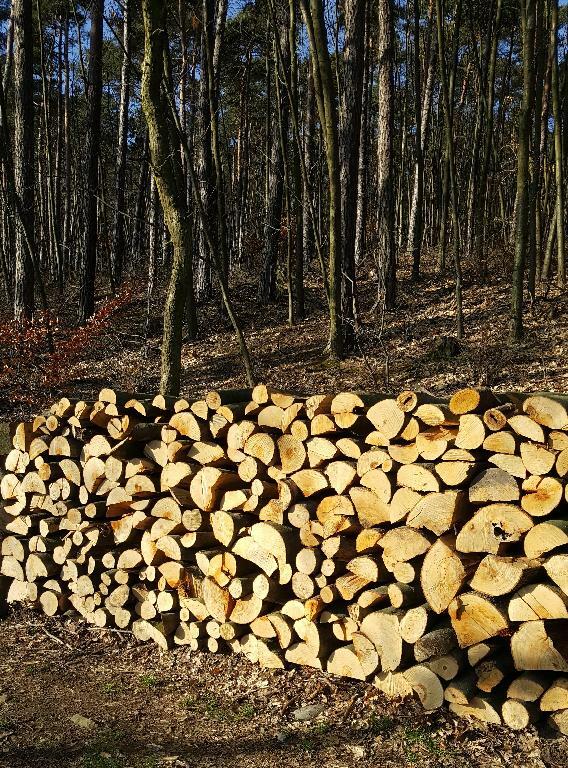 Wood is not recommended because it is so absorbent that it picks up flavours and gives them up again the next time used. Garlic flavoured chocolate is not everyone’s cup of tea. Chopping the basil coarsely makes the smashing process in the mortar considerably easier. The same applies to slicing the garlic. Using a mortar and pestle takes some practice. The action is one of pounding and grinding. Not adding too much material at one time makes it somewhat less daunting a task and keeps it from flying out when bashing furiously. Speaking of which, the bashing is a great way to relieve inner tension and can be quite therapeutic. 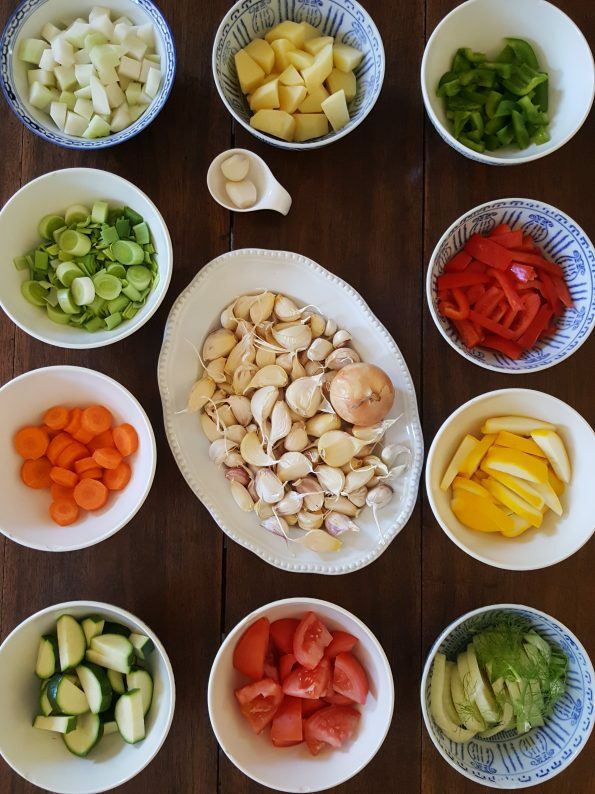 It’s also a way of connecting with the historical basis of cooking because the mortar and pestle have been used for food preparation for as long as 35,000 years. 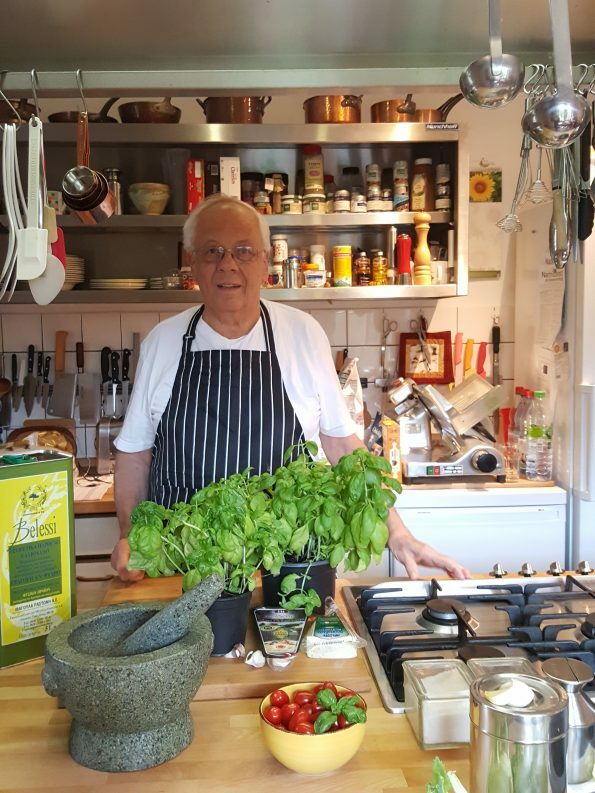 Antonio Carluccio recommends beginning by smashing the garlic to a paste and then adding the basil and finally the cheese and pine nuts. I often do that, or I start with the basil as in these pictures. 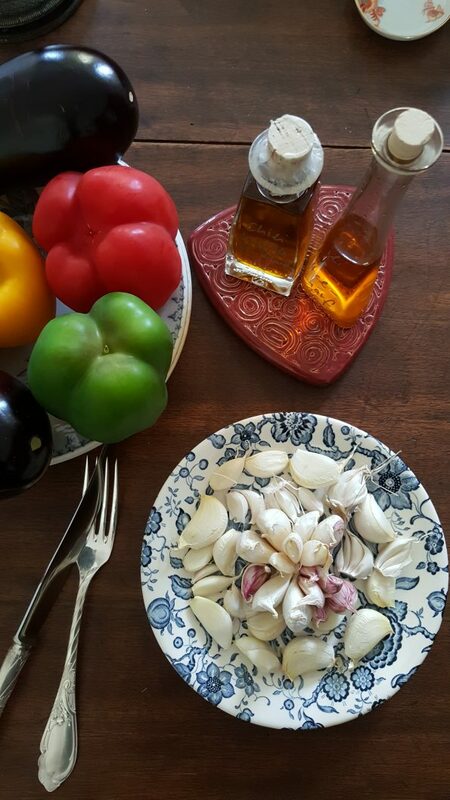 In any case you keep adding basil and garlic, then you can dribble some good olive oil in and begin a stirring action with the pestle. I like to use a peppery olive oil, but that is fully a matter of taste. When you have created an oily paste you can begin adding the cheese. Traditionally, a mixture of Parmesan and pecorino (from sheep milk) is used and you can’t go wrong if you stick with that. 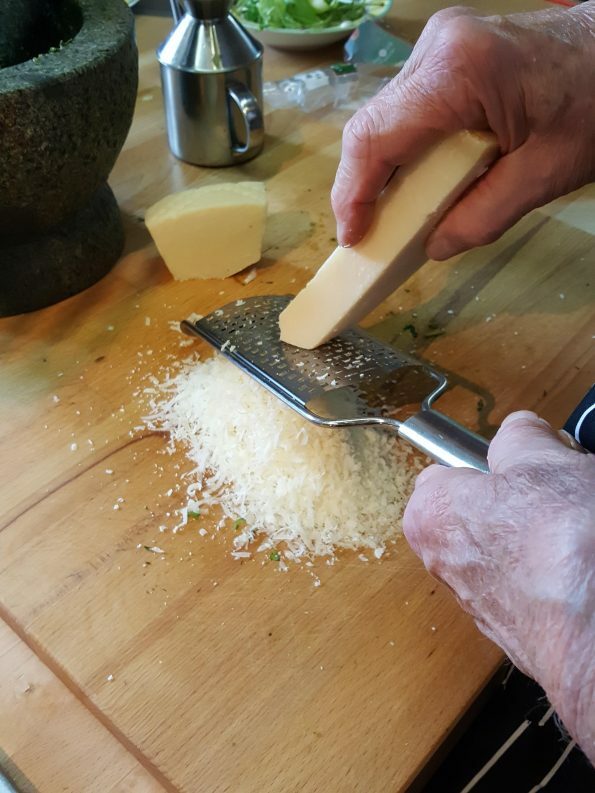 You can also just use Parmesan or try another hard cheese such as grana or even a year-old Gouda. This would not be wrong as Dutch cheeses were highly prized in Italy in the 18th and 19th centuries and were apparently often used in pesto. In any case an old Gouda adds spice to the pesto! You can keep adding cheese and oil until you have a smooth mixture and then begin adding the pine nuts. I don’t smash the pine nuts to a paste, but leave them as small chunks. Again, this is a matter of personal taste. The controversy of whether to roast the pine nuts or not is certainly also a matter of taste. I have stopped roasting them because I like the creamy consistency the unroasted pine nuts have when mashed, but the roasted add another dimension through the roast aroma. Try both and see which you like best, or do as we do and toss some roasted pine nuts onto the finished pasta. Add plenty of oil and put the pasta on to cook because your pesto is now ready to be enjoyed at the table! 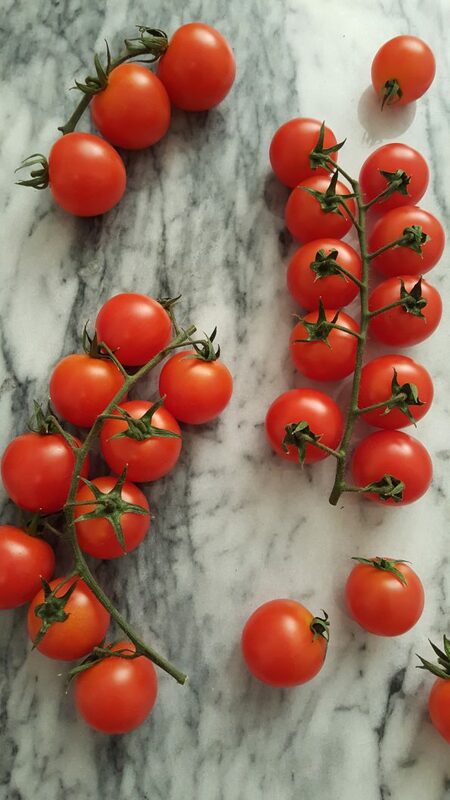 We hope you enjoyed this somewhat detailed discussion of this wonderful Italian specialty. 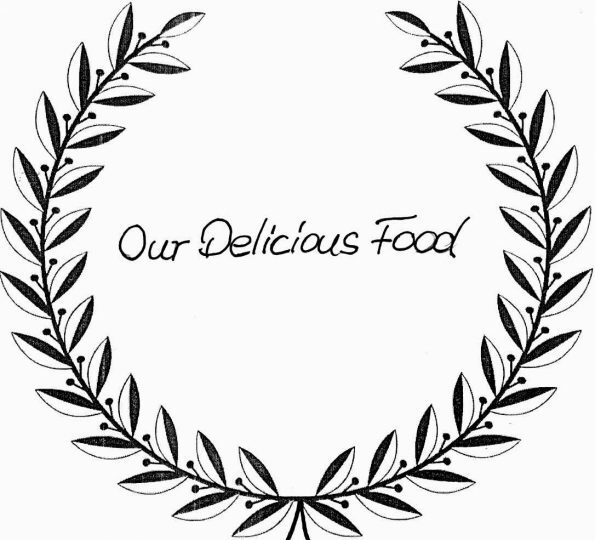 Next week we will have some new recipes to share and hope you will join us then. Sometimes things have to be quick. We love to cook and don’t shy away from more complicated recipes, but there are times when it is necessary to whip something together quickly. There is no reason not to make it delicious, of course! A surefire backup is pasta with pesto. 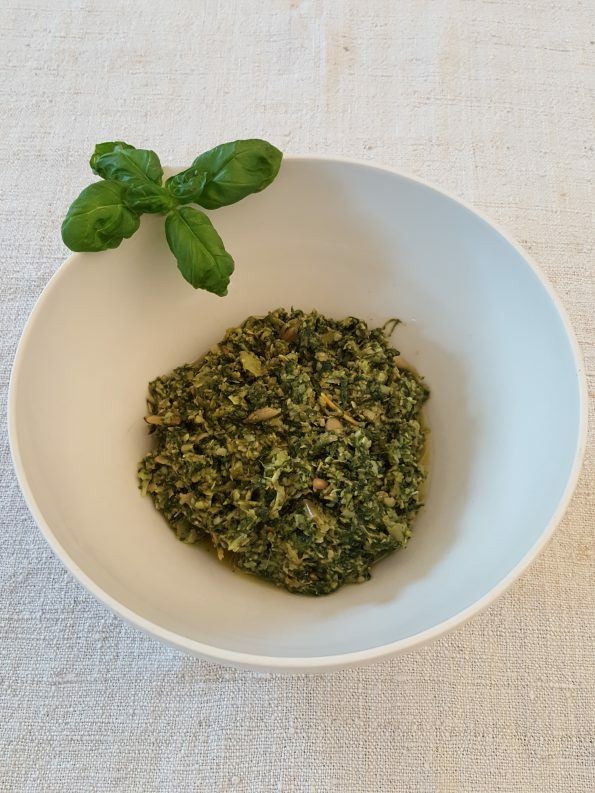 We prefer pesto alla Genovese, made with basil, but you can use other herbs such as rocket or flat-leaf parsely. 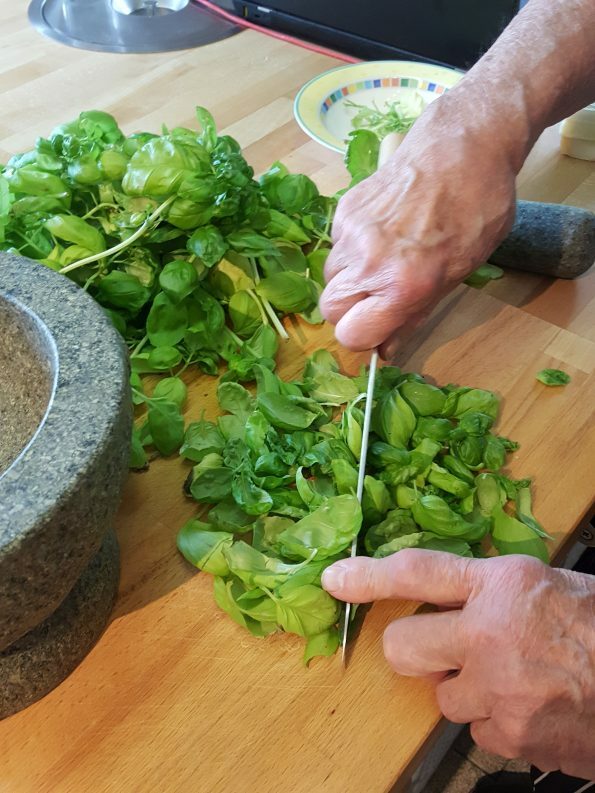 We buy large basil plants when they are on sale in the summer and make large batches of pesto (our recipe is in the recipe section) and put them in ice-cube trays and freeze them. They last a year or longer in the freezer and only need to be thawed to be used. We usually freeze them without the cheese and add grated Parmesan and pecorino after thawing, however you can freeze pesto complete with cheese if you don’t plan on keeping it too long. There are many wonderful uses for pesto, but the simplest is just to put it on pasta. 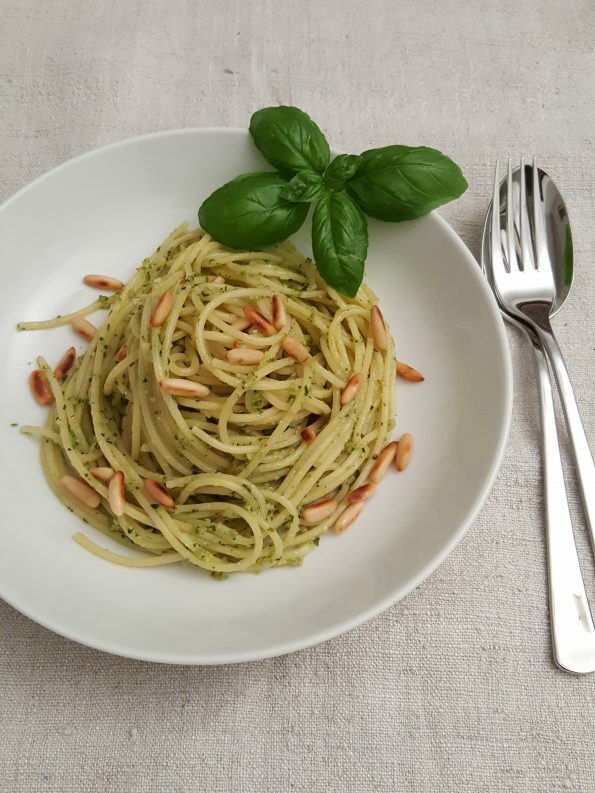 We prefer spaghetti and we often add some freshly roasted pine nuts on our plates. 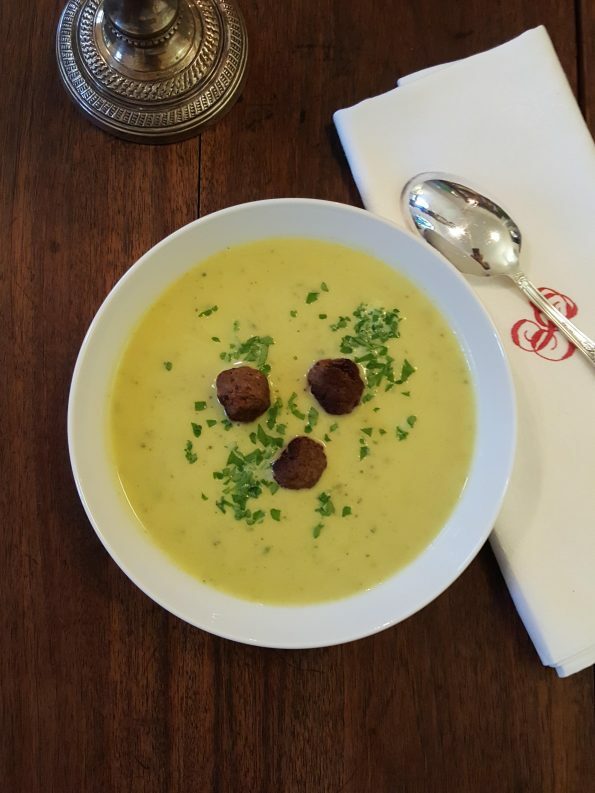 Cool evenings call for comfort food! We have been enjoying marvelous weather with blue, cloudless skies and temperatures in the low 20s °C. In the evening, however, temperatures drop and we have had some 10 °C nights. This calls for warm dinners and we have plenty of good recipes, both tried-and-true and some new ones to try out. 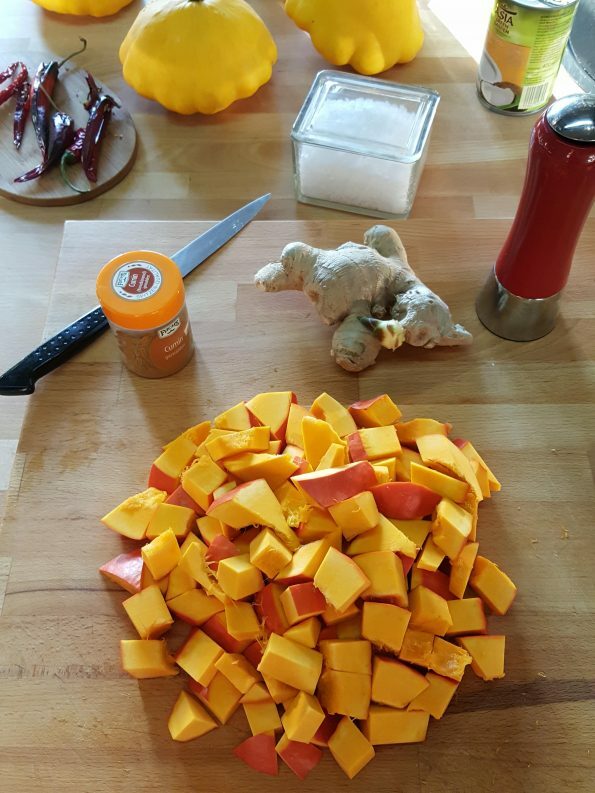 One of our all-time favorites is a spicy pumpkin soup with ginger, chilies and cumin. 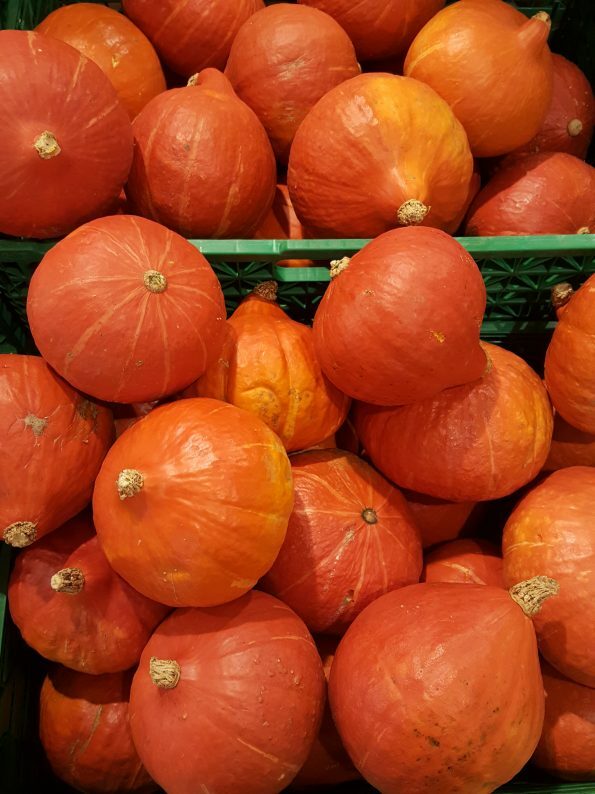 We usually use a Hokaido pumpkin, which is especially suitable because you don’t need to remove the skin. 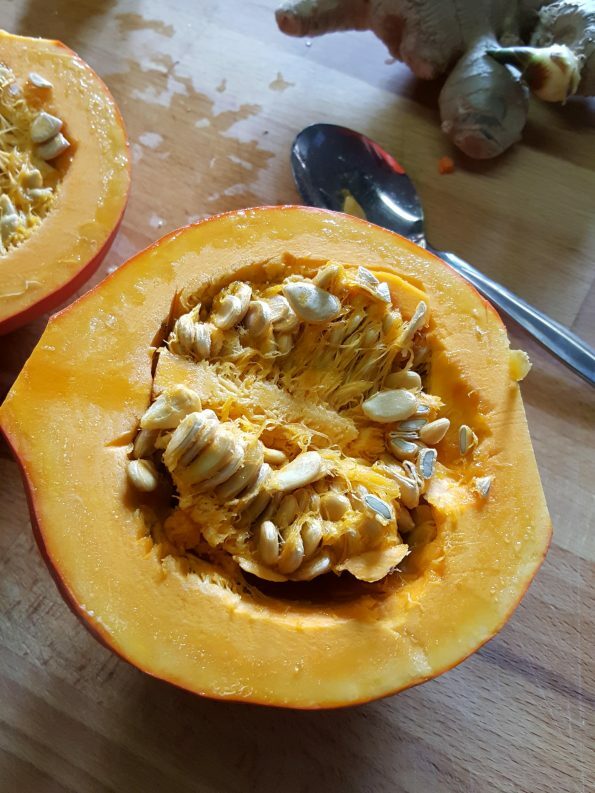 There is, however, no reason not to make this with a butternut squash, giant pumpkin, musquee de Provence or other winter squashes. This is a very quick and simple recipe. put on low boil for about 20 minutes, then puree, add about 3 Tblsp. cream, adjust seasoning and serve with chopped cilantro (coriander greens). 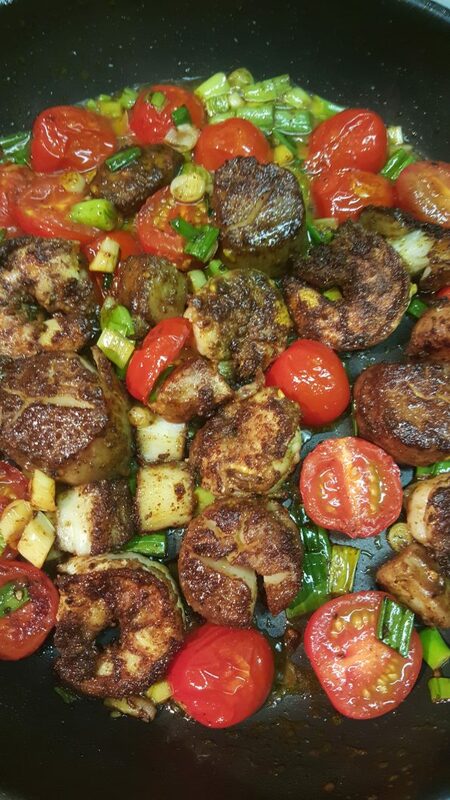 We sometimes make up very simple little Moroccan spiced meatballs to put in the soup. 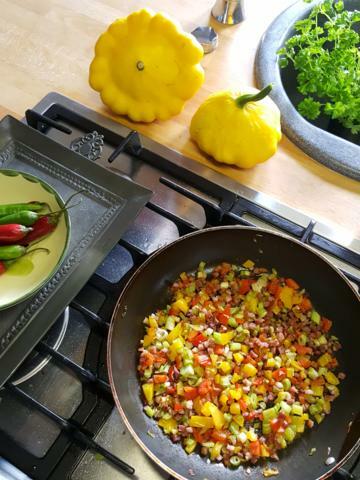 To one pound of ground beef we add 1 – 2 tablespoons of ras-el-hanout or baharat (northern African spice mixtures), garlic, salt, pepper and dried chilies and fry in olive oil just until done through (about 10 minutes). Fresh baguette or sourdough bread make a perfect accompaniment. We especially like this recipe because it spices up the broccoli with pancetta and mozzarella. 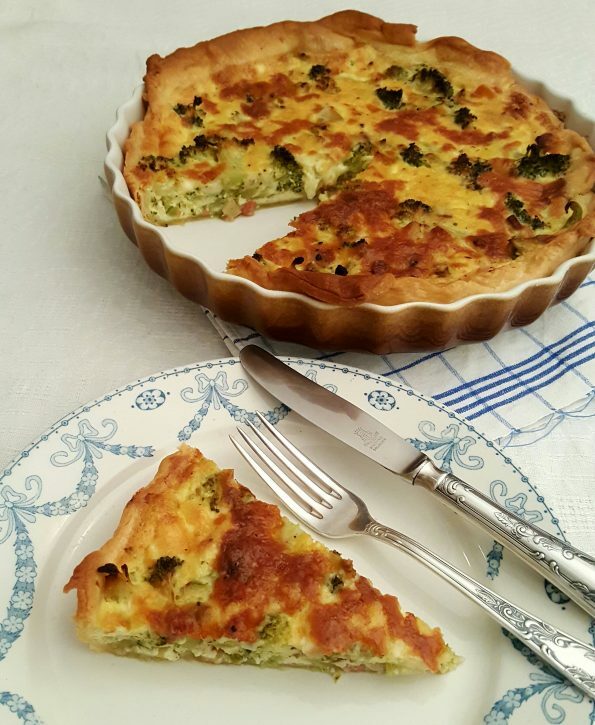 The recipe is simple and quick and is definitely worth making. 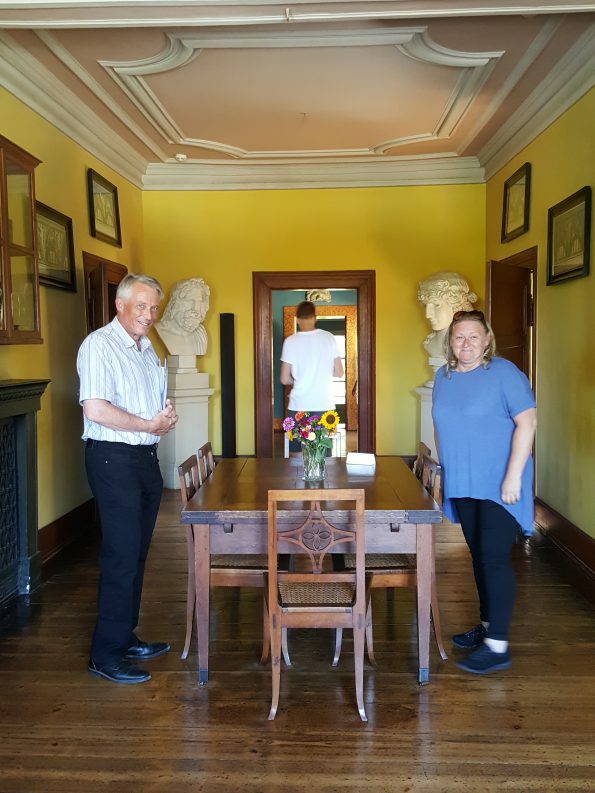 We had wonderful guests from Essex, UK and did some traveling and sight seeing with them. 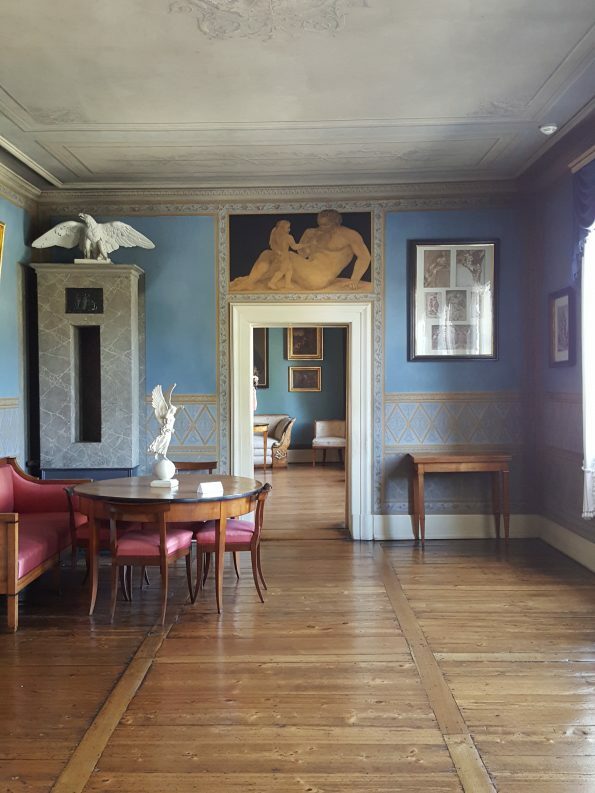 The weather was beautiful and unseasonably warm for September with temperatures in the 30s °C so we headed off to Weimar where we visited Goethe’s home and museum. 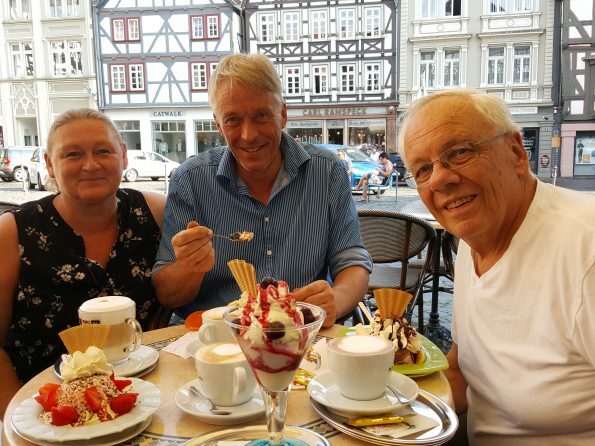 The next day we drove in to Alsfeld and walked around the beautiful, old historical part of the medieval town. It was still quite warm and we treated ourselves to some ice cream creations at the Italian ice cream parlor in the middle of the town square. Having guests gave us a good opportunity to do some cooking, too. It was fun and as usual our guests spent much time watching and/or helping in the kitchen. 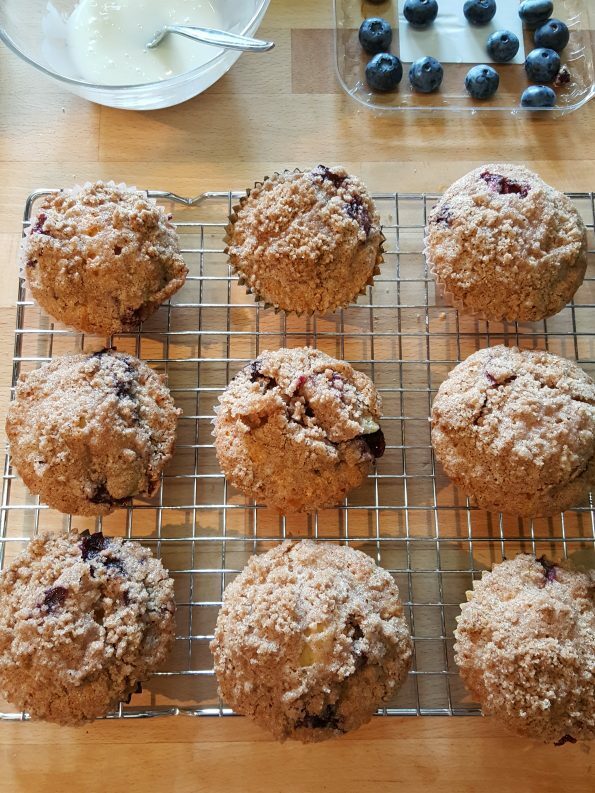 Karin fixed a pork tenderloin in Gorgonzola cream sauce with wide noodles and, of course, we did plenty of baking including these gorgeous blueberry muffins with streusel topping. Preheat oven to 400 °F (200 °C). Grease muffin tins or line with paper liners. Muffin dough: Combine 1 1/2 cups flour, 3/4 cup sugar, salt and baking powder. Place vegetable oil into a 1 cup measuring cup; add the egg and enough milk to fill the cup. Mix this with flour mixture. Fold in one cup of blueberries. Fill muffin cups to the top, and sprinkle with streusel topping mixture. Streusel topping: Mix together 1/2 cup sugar, 1/3 cup flour, 1/4 cup butter, and 1 1/2 teaspoons cinnamon. Mix with fork, and sprinkle over muffins before baking. Bake for 20 to 25 minutes in preheated oven, or until done (cake tester comes out dry). Let cool on rack. Mix lemon juice with confectioners’ sugar to make a thick paste. 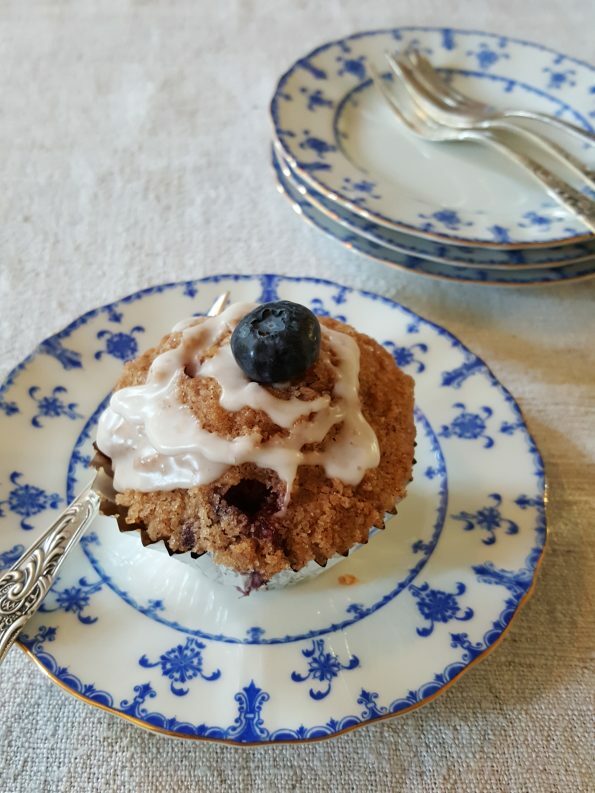 Drizzle over muffins, decorate with one or more fresh blueberries and allow to set. 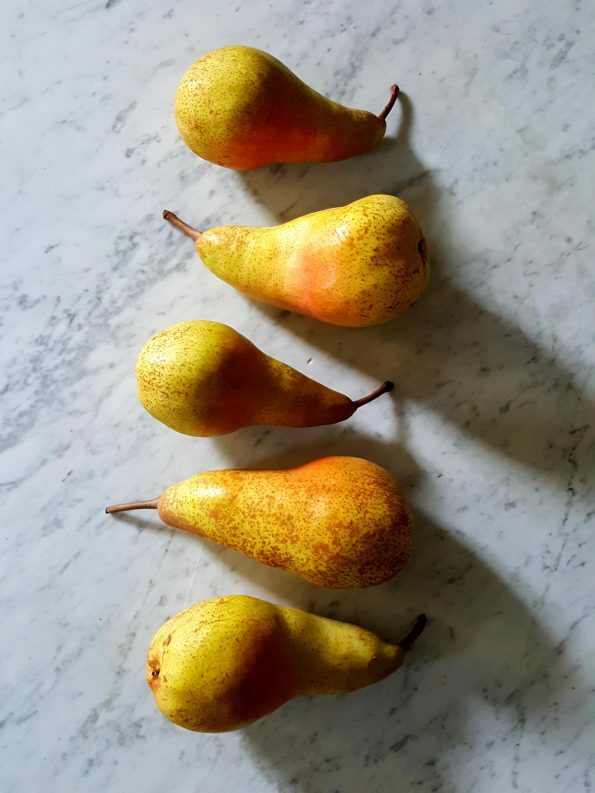 A few days after our guests left we were shopping and discovered some beautiful, ripe Bosc pears. 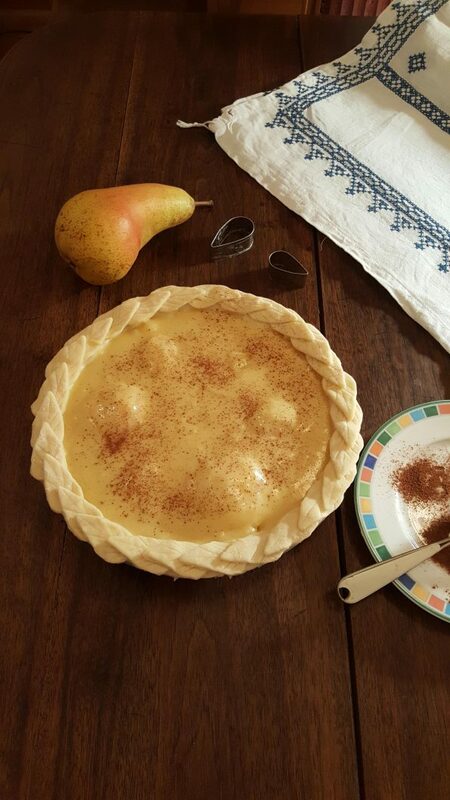 These are firm and especially suited to baking so we decided to make a pear pie. A double pie dough recipe, enough for a 9″ pie plate top and bottom crusts. Divide the dough into two equal parts, form a disk of each, wrap in plastic wrap and refrigerate for at least an hour. Preheat the oven to 450 °F (230 °C). In a large bowl, stir together the sugar, flour, cinnamon and cloves. Add the pears and toss to coat. Roll out one of the dough disks for a bottom crust and line the plate. Coat the bottom crust with egg white or melted butter to keep it from becoming soggy. 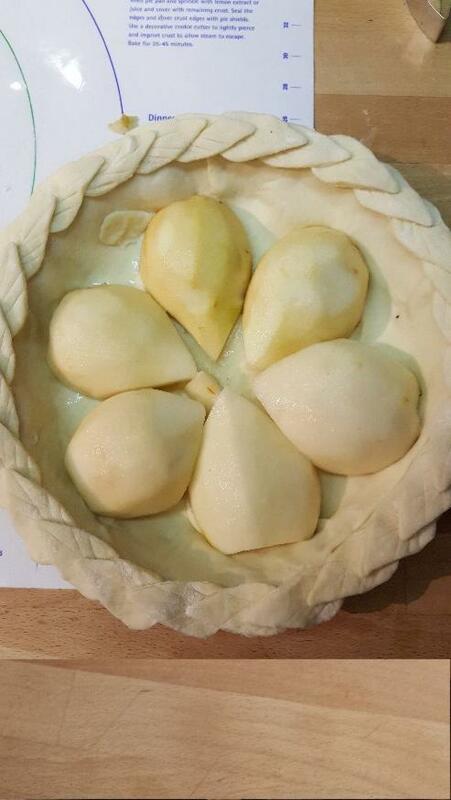 Transfer the pear filling to the pie pan and arrange the slices so there are no spaces. Dot the pears with the butter. Roll out the second disk of dough to an 11-inch round and cut into strips with a knife or zig-zag wheel. Weave the strips over the top of the pie to make a lattice and seal the edges with decorative punched-out buttons of rolled-out dough. Alternatively, you can just roll out a simple crust and cover the pie with that, crimping the edges together with the lower crust. Don’t forget to cut slits in the crust to allow steam to escape. 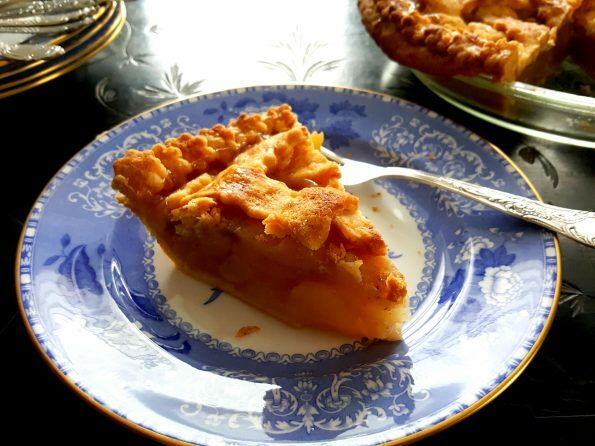 Mix the milk, sugar and butter and brush this glaze over the pie. Bake in the hot oven for 10 minutes, reduce the heat to 350 °F (175 °C) and continue to bake for about 50 minutes or until the crust is golden brown and the filling begins to bubble through the lattice or vent slits. Let the pie cool on a rack, about 3 hours. Serve warm or at room temperature. We enjoyed half of the pie and gave the other half to our friends. It was very good with vanilla ice cream or with whipped cream. 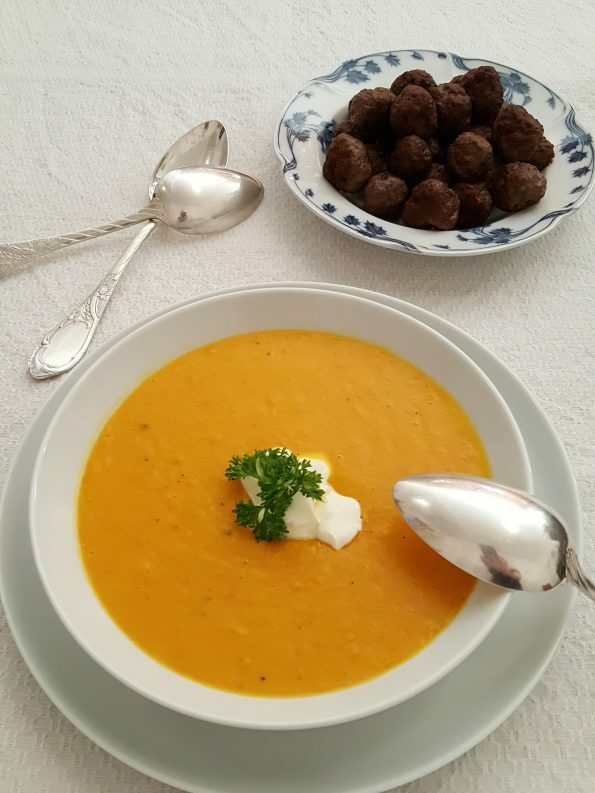 Now that autumn has arrived, the temperatures are sinking and all of the wonderful fruits of the autumn harvest will be available there will be ample opportunity to do some comfort food cooking. We’ll be sharing some of our standard recipes and trying out some new ones. It’s going to be an exciting time! Thanks for joining us. I had no real plan for how often I would make an addition here, but I will try to get something in every week. It’s a bit of a challenge since we are still renovating/rescuing/rebuilding/restoring or 20+ room, 4-story, 115 year old home, but there is always something to report on. 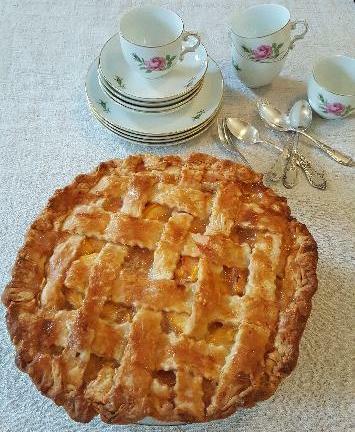 This last weekend we had guests and we made a peach pie. 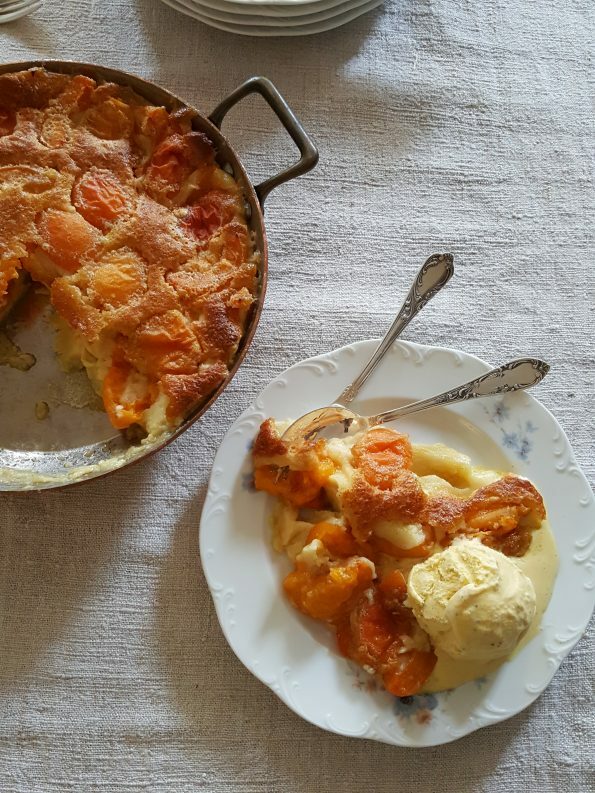 We bought 10 very nice, ripe peaches and I used my mother’s pie-dough recipe that I have been using for the last years. I don’t make enough pies to have the practice that makes bringing the dry and wet ingredients together the simple process it should be. 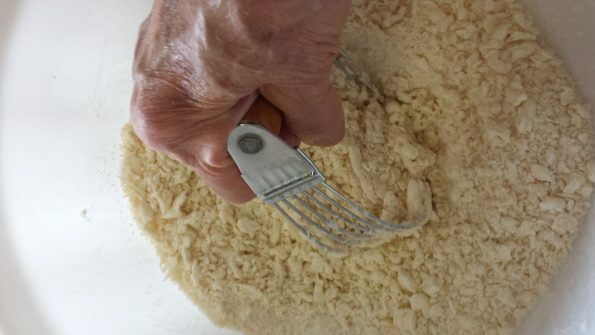 A friend of mine suggested using the pastry cutter, not only to mix the flour and shortening, but to use it to bring the liquid into the mixture. It worked like a charm and I will do that in the future. Once again I made up the recipe as I went along, using bits and pieces from here and there and I was generally very happy with the results. 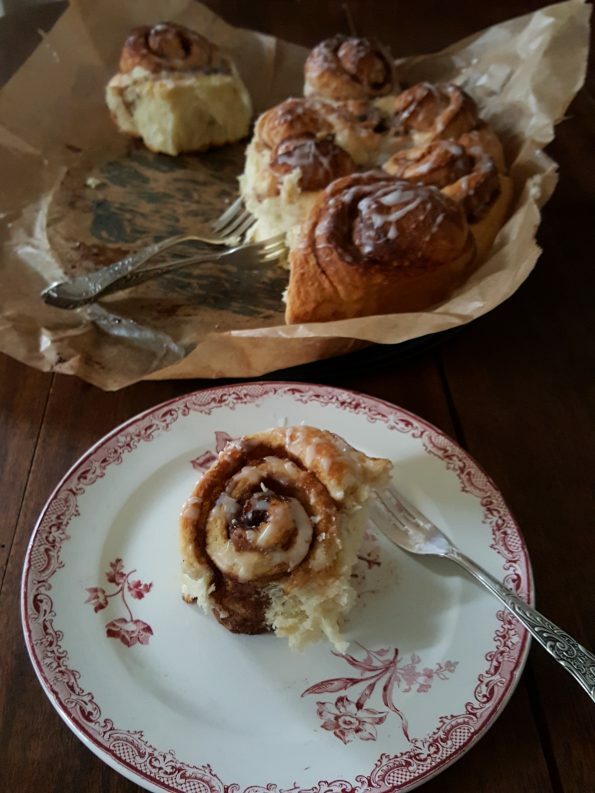 I did take notes so I can share the recipe here and in our recipe archive. 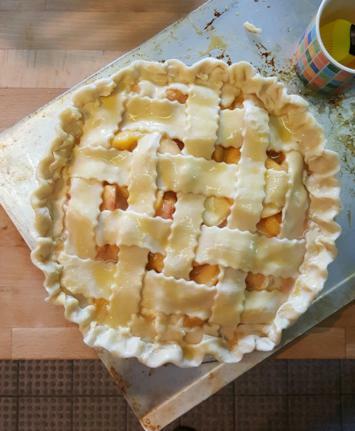 One thing I might change, however, is not to use flour with the peaches, but rather use cornstarch. The flour made a rather dense “sauce” and I would have liked it to be a bit lighter. Nonetheless, the results were most satisfying and our guests enjoyed it with vanilla ice cream and a cappuccino. 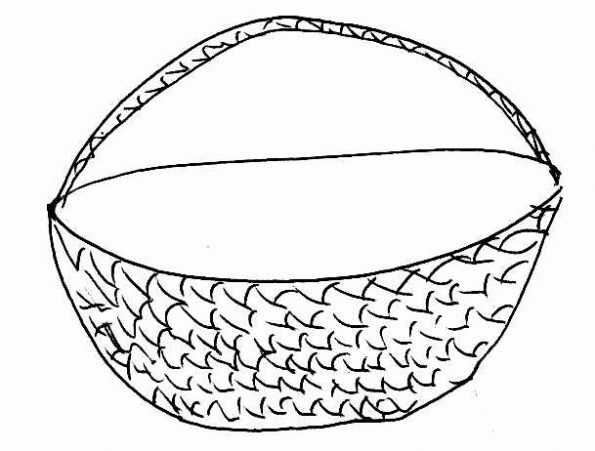 Line the bottom and sides of a 9 inch pie plate with one of the pie crusts. 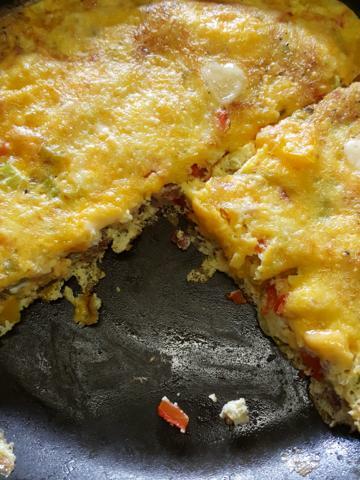 Brush with some of the beaten egg to keep the bottom crust from becoming soggy. Place the sliced peaches in a large bowl, and sprinkle with lemon juice. Mix gently. In a separate bowl, mix together the flour, sugar, cinnamon, nutmeg and salt. Pour over the peaches, and mix gently. Pour into the pie crust, and dot with butter. 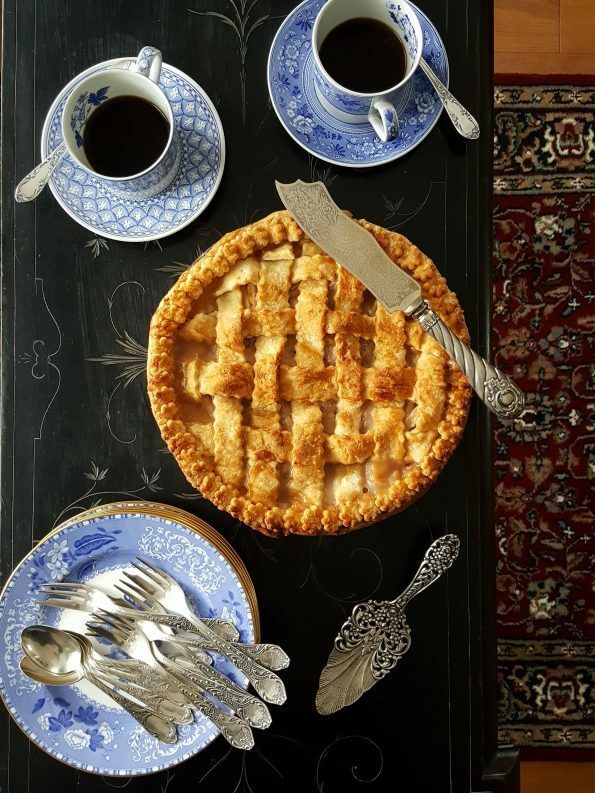 If you wish to make a lattice crust as we did you can roll out and cut pastry with a zig-zag wheel or straight with a knife and lay out the lattice as usual. You can also just make a closed upper crust, but don’t forget to make slits in it to vent the steam. Brush the remaining egg over the top crust. Cut several slits in the top crust to vent the steam. Bake for 10 minutes in the hot oven, then reduce the heat to 350 degrees F (175 degrees C) and bake for an additional 40 – 45 minutes, until the crust is brown and the juice begins to bubble through the lattice or the vents. If the edges brown to fast, cover them with a skirt of aluminum foil. Cool before serving. The pie tastes better warm than hot. 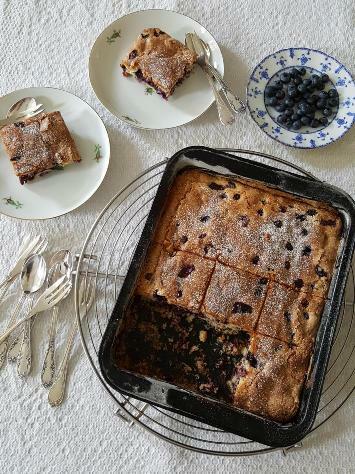 We saw some beautiful blueberries on sale and rather than making jam, we decided to make a cake. Looking around the Internet we found a recipe from “IRENED” on Allrecipes that sounded good. I’ll copy the recipe in the archive (see “Recipes” in the menu above). It turned out very well and I wouldn’t really change anything from the original recipe. 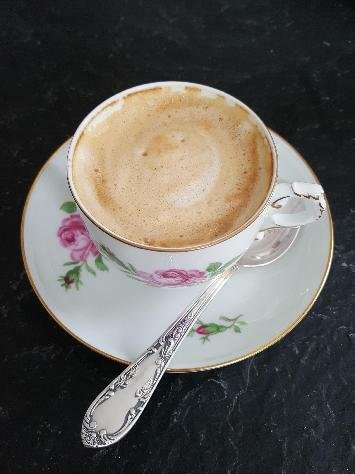 We enjoyed it with a cappuccino made from our own freshly roasted coffee, a blend of Colombian, Ethiopian, Sumatran and Honduran beans. We didn’t have much of a summer here in central Germany this year. June, July and the beginning of August were cool and rainy. Now in the last week of August it suddenly turned very warm with temperatures into the mid 30s °C. The warm weather is enjoyable, but the humidity also goes up and we find ourselves becoming rather lethargic. Nonetheless, we have been cooking and baking and having fun in the kitchen. 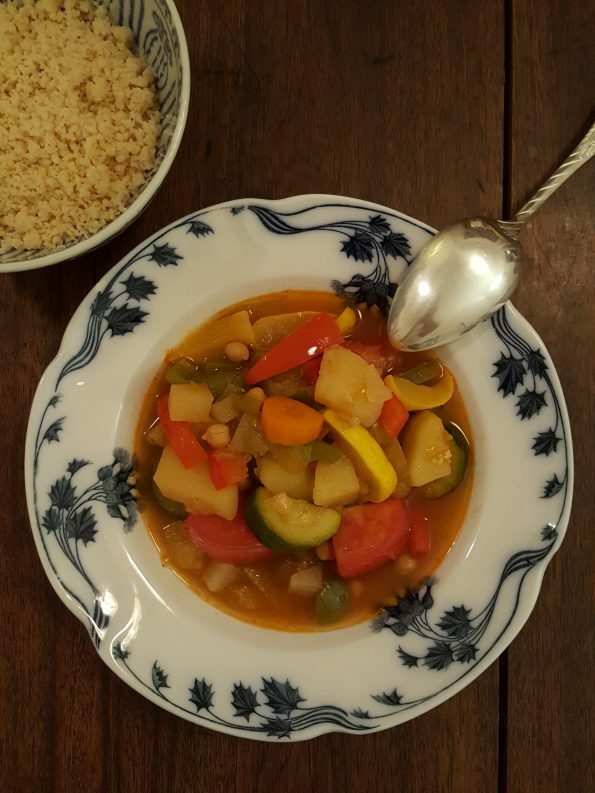 Karin made her favourite couscous with vegetables on Saturday. Recipe in the Archive. It’s “Zwetchgen” season in Germany. The beautiful, blue damson plums lend themselves perfectly to baking so I made a plum pie. I made up the recipe as I went and put a streusel topping on it and mixed some ground walnuts into the streusel. 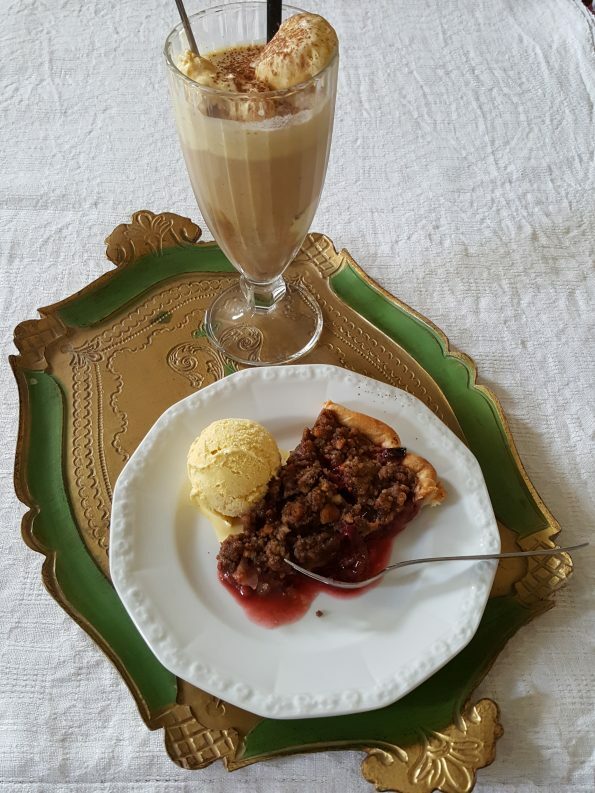 It was delicious with vanilla ice cream and an iced coffee, or Affogado on a hot Sunday afternoon. 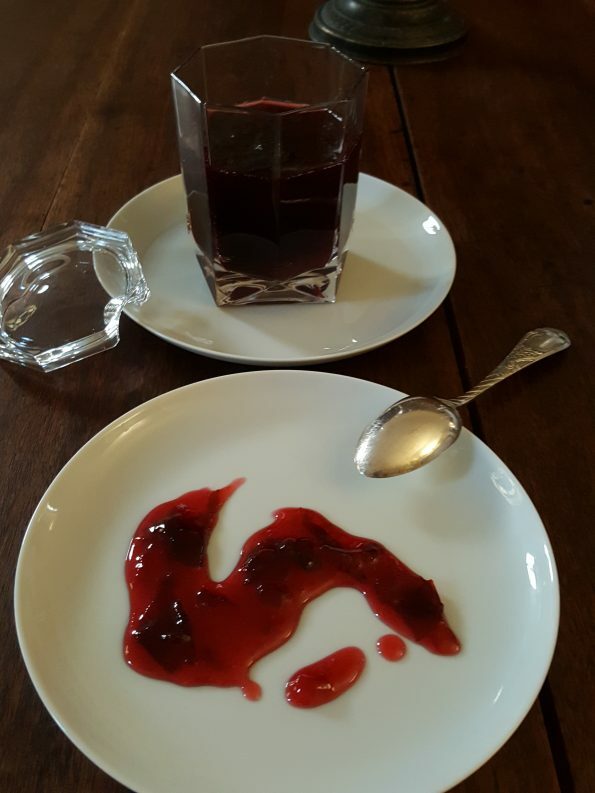 We made jam out of the rest of the damson plums and it turned out beautifully. We do not use gelling or jam sugar or add pectin, but cook until the thermometer reads 215 °F (108 °C) or “thread stage.” The flavour is far superiour in our experience, to jams made with additional pectin. 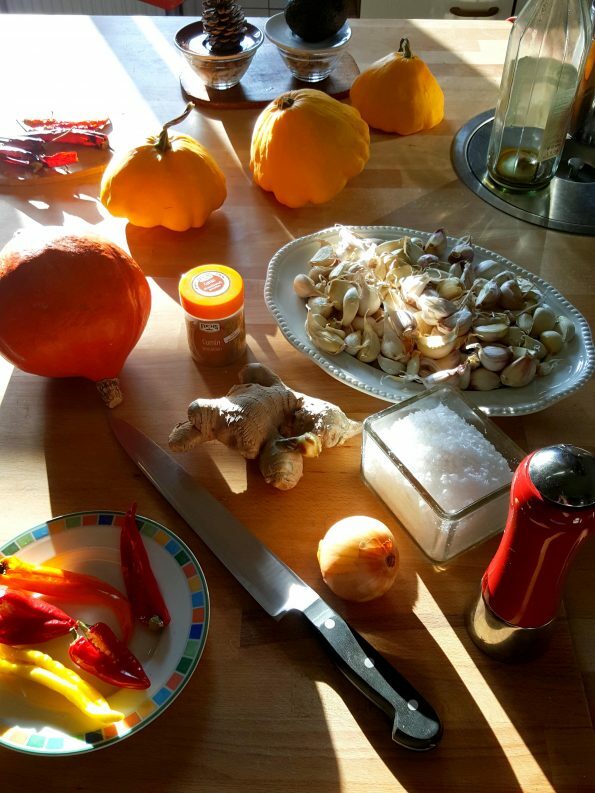 As autumn approaches we will have many new cooking adventures with winter squash, them many winter Brassicas and of course, Thanksgiving dinner. We had about a pounds of apricots left so I made this lovely apricot tart. It was very tasty with a dollop of vanilla ice cream and a cappuccino in the afternoon.